1. Line 2 cookie sheets with wax paper. Set aside. 3. Spoon the blue melted chocolate over 12 of the pretzels coating each pretzel evenly. Place on cookie sheet at least 2 inches apart from each other. 4. 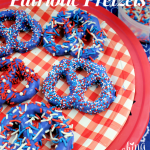 Immediately sprinkle your choice of red, white and blue jimmies and sprinkles and white sugar pearls on the pretzels before the chocolate completely hardens. 5. Let pretzels “set” on cookie sheets for 30 minutes before serving.